An echo is simply a reflected sound wave. Echoes are more noticeable if you are out in the open except for a distant, large object. If went out to the dessert and yelled, you might hear a distant canyon yell back at you. The time between your yell and hearing your echo depends on the speed of sound and on the distance to the to the canyon. 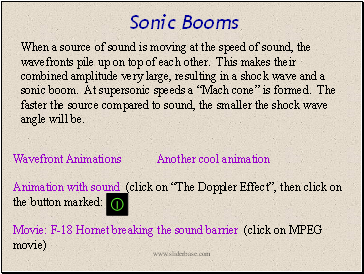 In fact, if you know the speed of sound, you can easily calculate the distance just by timing the delay of your echo. Reverberation is the repeated reflection of sound at close quarters. If you were to yell while inside a narrow tunnel, your reflected sound waves would bounce back to your ears so quickly that your brain wouldn’t be able to distinguish between the original yell and its reflection. It would sound like a single yell of slightly longer duration. In addition to locating prey, bats and dolphins use sound waves for navigational purposes. Submarines do this too. The principle is to send out sound waves and listen for echoes. The longer it takes an echo to return, the farther away the object that reflected those waves. 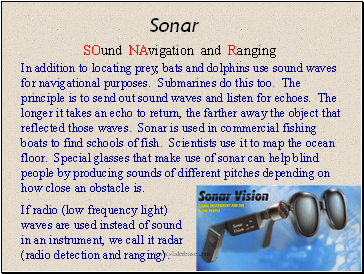 Sonar is used in commercial fishing boats to find schools of fish. Scientists use it to map the ocean floor. Special glasses that make use of sonar can help blind people by producing sounds of different pitches depending on how close an obstacle is. If radio (low frequency light) waves are used instead of sound in an instrument, we call it radar (radio detection and ranging). 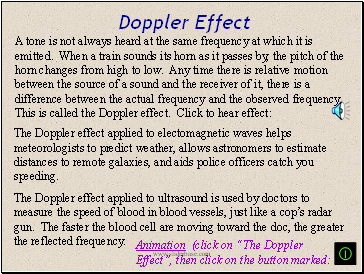 The Doppler effect applied to electomagnetic waves helps meteorologists to predict weather, allows astronomers to estimate distances to remote galaxies, and aids police officers catch you speeding. The Doppler effect applied to ultrasound is used by doctors to measure the speed of blood in blood vessels, just like a cop’s radar gun. The faster the blood cell are moving toward the doc, the greater the reflected frequency.